Reached Meerut today by 1400hrs, took lunch and rushed to hospital to meet Swati. 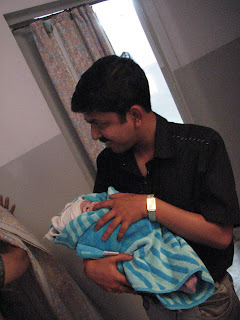 At 1620 hours, the little angel came into OUR life, Yes! this family is like my second home. She is so pretty and cute and tiny and lovely. Holding her was all together a different experience. Congrats to the proud parents.It is indeed an awesome experience to have a child.It is to decide forever to have your heart go walking outside your body.